This small drop-leaf work table was used by Martha Jefferson Randolph for sewing. 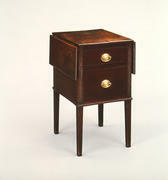 The faces of the drawers have a scratch bead, and the base is surrounded by a large astragal molding; both features are typical of Monticello joinery craftsmanship. Among Monticello-made furniture, the reeding on the front is unique. The interior shelves are attached in exactly the same manner as the shelves on the joinery-made dumbwaiters.